Paolo di Dono was a painter, draughtsman and designer of stained glass and mosaics. According to Vasari the name Uccello (meaning bird in Italian) derives from his love of those animals. It seems that Uccello trained in the workshop of Lorenzo Ghiberti between 1404 and 1407 and by 1415 was working as an independent master. His career, in particular the early part, is difficult to reconstruct due to the lack of surviving documentation. 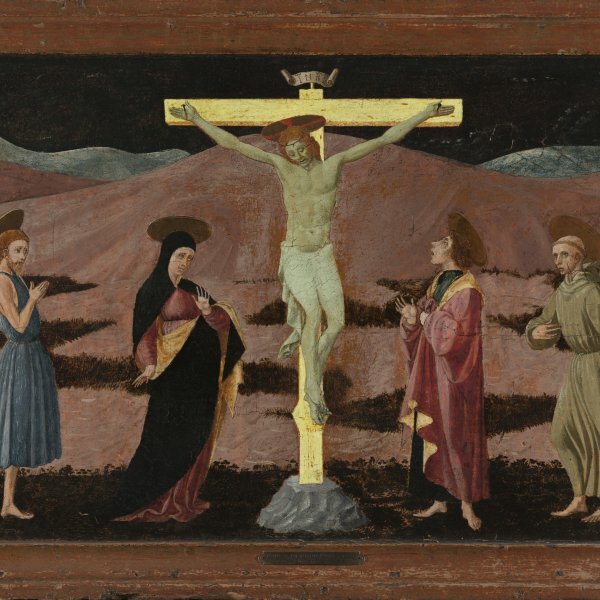 Around 1430 Uccello undertook the first of two fresco cycles for the Chiostro Verde of Santa Maria Novella. Among his most famous works is the fresco of Sir John Hawkwood (Duomo, Florence), painted in the manner of an equestrian statue. Dating from 1436, it reveals his interest in the study of perspective and his geometrical approach to natural forms. Between the 1440s and 1460s Uccello evolved a study that combines the late Gothic with the innovations of the Florentine Renaissance. A clear example is his fresco cycle for San Miniato al Monte, which reveals the influence of Donatello’s sculpture and Alberti’s theories on the depiction of space. Between 1445 and 1446 Uccello moved to Padua to execute a decorative cycle for the Casa Vitaliani, which is now lost but is considered of great importance for its influence on other painters such as Andrea Mantegna. Among Uccello’s most celebrated and characteristic works is the second cycle of frescoes in the Chiostro Verde, in which the depiction of Noah is said to be a self-portrait. Also from this period are the three famous panels of The Battle of San Romano (now Musée du Louvre, Paris, National Gallery, London, and Galleria degli Uffizi, Florence), in which Uccello’s interest in the depiction of animals is reflected in the brilliantly foreshortened horses. Among his late works are the two versions of Saint George and the Dragon (National Gallery, London, and Musée Jacquemart-André, Paris). Uccello was also an outstanding draughtsman and had a significant number of followers. He was an artist of particular importance for the evolution of Florentine painting, particularly for the work of Piero della Francesca and Leonardo da Vinci. Uccello died in Florence in 1475 and was buried in Santo Spirito.